Process all individuals being incarcerated into or released from the Lubbock County Detention Facility. Reception to the public, attorneys, and bonding company personnel for information and documentation regarding individuals that are incarcerated or on work release programs. WORK ENVIRONMENT: Jail environment: potential emergency situations; close work with incarcerated individuals; irregular working hours; possible exposure to body fluids and communicable diseases; and persons using vulgar and abusive language. The noise level in the work environment is moderate to loud. Requirements: High school diploma or GED and must be at least 18 years of age. Must have the ability to communicate effectively with others in writing and verbally; a language skills assessment will be given. Must possess a valid Texas driver’s license. Starting salary: $12.96/hour. Applicants must attach documentation of most recent typing score to their application (35wpm 80%accuracy minimum). To be considered for the position, an online application will need to be submitted. If you meet the qualifications for the position you will be scheduled for a Physical Fitness Assessment. If you do not receive a call for the Physical fitness Assessment please check your application status online. Closing Date: 6/30/19. To maintain the immediate security, care and control of inmates and the Lubbock County Detention Center structure; ensuring compliance with all local policy and procedure and Texas minimum jail standards. Starting Salary $19.309 per hour. Requirements: High School Diploma or GED and must be at least 21 years of age. CERTIFICATES, LICENSES, REGISTRATIONS: Possession of or ability to obtain, a Basic Jailer’s License from the Texas Commission on Law Enforcement (TCOLE). Must have the ability to communicate effectively with others in writing and verbally. Must possess a valid Texas driver’s license. Extensive background checks will be conducted. You must be available for all shifts. To be considered for the position, an online application will need to be submitted. If you meet the qualifications for the position you will be scheduled for a Physical Fitness Assessment. If you do not receive a call for the Physical fitness Assessment please check your application status online. Closing Date: 6/30/19. Communications Operator to receive and processes 9-1-1 emergency and non-emergency calls through various methods. Ability to maintain composure during high stress situations and efficiently multi-task in constrictive time frames. Ability to operate multiple computer software programs, operator standard office equipment and two-way radios. Required: High school diploma or GED, minimum of one year of uninterrupted experience in public contact and clerical work along with the ability to type at a speed of 45 wpm and be at least 18 years of age. Applicants must attach documentation of most recent typing score to their application. Starting salary: $15.54/hour. To be considered for the position, an online application will need to be submitted. If you meet the qualifications for the position the Human Resource Department will email you the Personal History Statement. If you do not receive an email with the Personal History Statement attached; please check your application status online. Should you receive a Personal History Statement it must be completed and returned within seven days to Human Resources, PO Box 10536, Lubbock, TX 79408. Closing Date: 6/30/19. The T.A.G. administrator will provide administrative duties in a multi-agency environment consisting of co-located state, federal and local law enforcement agencies currently funded, in part, by a grant from the Criminal Justice Division (CJD) of the Texas Governor’s Office. The TAG Administrator coordinates communications between TAG agencies and serves as the TAG Center primary liaison to the Grant Project Director in administering the grant, which includes reporting metrics and applying for additional grants as the TAG continues to operate. The TAG Administrator, working in conjunction with the Project Director, is responsible for ensuring the grant funds are properly expended and recorded. The TAG Administrator is the primary contact with the building management/landlord, contractors and vendors to ensure an efficient, safe and healthy office environment. The TAG Administrator acts as the facilities superintendent and will address and correct facilities issues as they arise. The TAG Administrator is required as necessary to pick up and transport to the TAG Center equipment and supplies. Requirements: Bachelor’s Degree from Accredited University or equivalent experience. 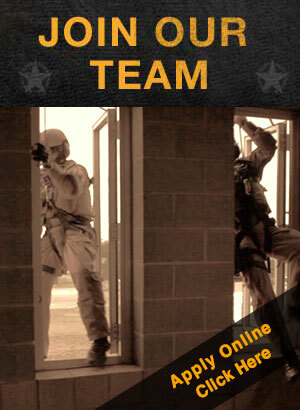 Extensive experience in Law Enforcement, preferably with a management focus. Preference will be given to those with experience in developing and managing complex investigation programs. Preference will be given to those with experience managing gang and or drug investigation programs. Preference will be given to those with experience in the HIDTA or TAG programs. Starting Salary: $90,750.40. To be considered for the position, an online application will need to be submitted. If you meet the qualifications for the position, the Human Resource Department will email you the Personal History Statement. If you do not receive an email with the Personal History Statement attached; please check your application status online. Should you receive a Personal History Statement it must be completed and returned within seven days to the Sheriff’s Office, 712 Broadway or mailed to PO Box 10536, Lubbock, TX 79408. Closing Date: April 22, 2019. Responsible for providing personal security and protection for the judges and the general public; Facilitates communication between the judge and the jury during trials. Responds to emergency calls from courts and offices in the courthouse, also county owned buildings. Certificates, Licenses, Registrations: Peace Officer Certification from TCOLE. Qualifications: Physical assessment will be required consisting of a one mile run in under 12:30 minutes, be able to complete 20 pushups in a minute and 20 sit-ups in a minute. A firearms qualification with department issued weapon prior to interview. Physical assessment and Firearms qualification will be waived if already assigned to the Law Enforcement Division and have completed within the last six months. Starting salary: $40,162.72. To be considered for the position, an online application will need to be submitted. If you meet the qualifications for the position the Human Resource Department will email you the Personal History Statement. If you do not receive an email with the Personal History Statement attached; please check your application status online. Should you receive a Personal History Statement it must be completed and returned within seven days to the Lubbock County Sheriff’s Office, 712 Broadway, Lubbock, Texas, 79401, or mailed to PO Box 10536, Lubbock, TX 79408. Closing Date: April 23, 2019.